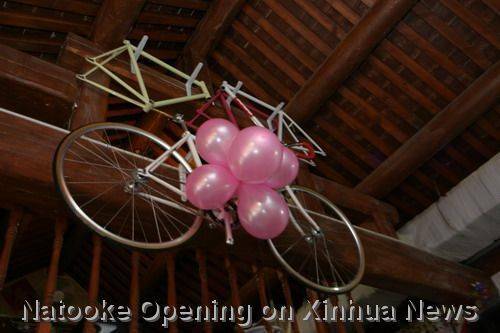 Regarding our 耍 － NATOOKE － 商店: Shop Opening Party today there were already quite some articles online on various sites also with pictures of our event. 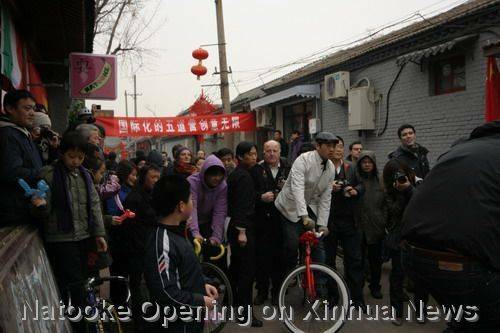 Another article was on Xinhua news website. 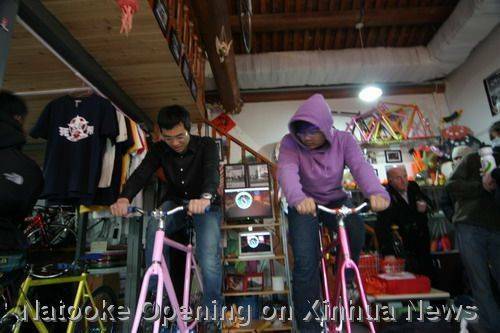 I like this picture of our track standing competition during our bike and juggling shop opening party. 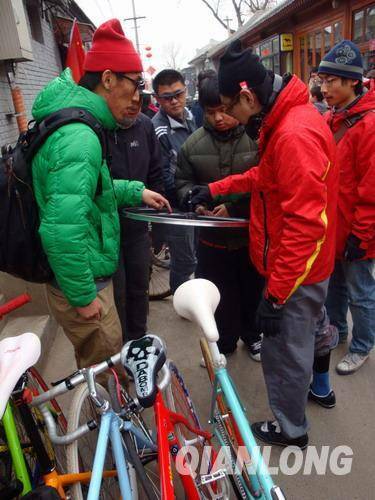 Another one on sohu.com “低碳生活国际交流会”儿童用表演诠释低碳出行(组图)Full article here. 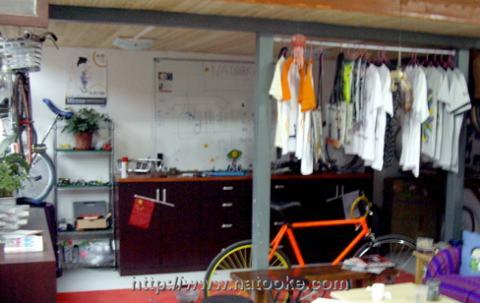 This afternoon I took some pictures of our Natooke bicycle and juggling equipment shop. We are currently getting various products delivered and waiting for a lot more that we ordered before the Chinese New Year holiday. I uploaded all pictures of how our store looks like today to this webalbum. 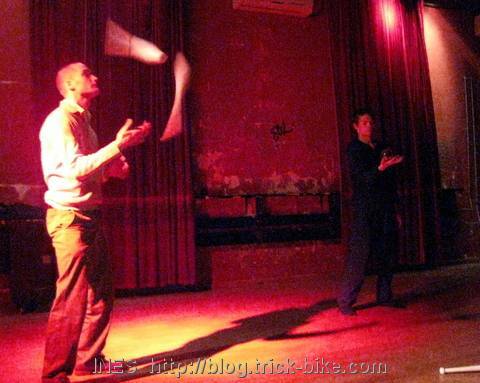 As every Monday night the Beijing Jugglers group met at the bar called Yugong Yishan. Today probably due to the very icy cold weather not many people came. 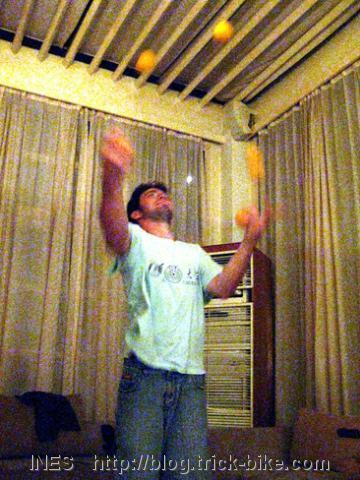 Fede was mainly juggling balls. 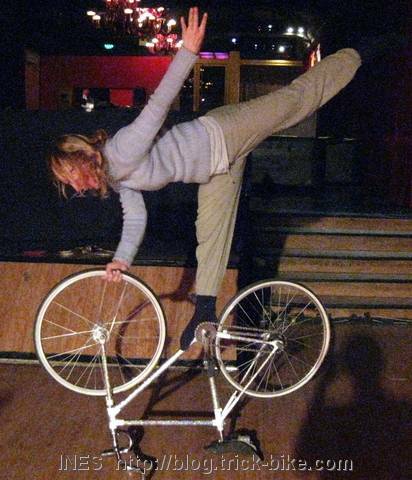 And I tried some tricks on a static bike for a performance in Tokyo where I will only have 3 times 4 meters. 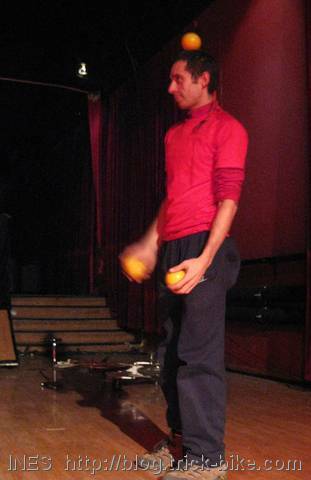 The Italian juggler Federico Moro did a ball juggling performance with up to 5 balls choreographed to a new song of Jess. After playing all the new songs that are on the Divine CD then Meiyouwenti Records brought some reggae music with the DJ Oscar who gave us a nice grove for dancing. 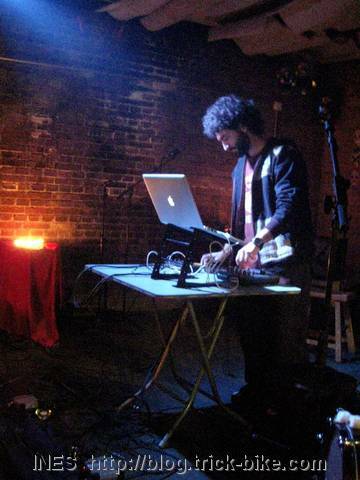 There was a nice article about the concert published in the Global Times. Check it out! 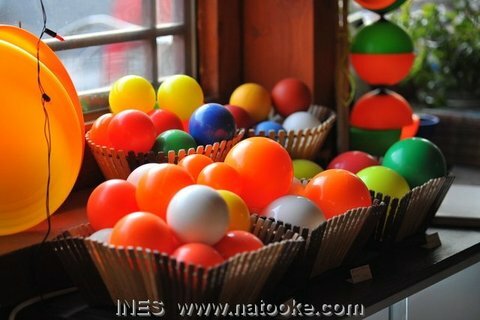 I found our Natooke bike and juggling shop listed on various Chinese websites. I will just a few here. 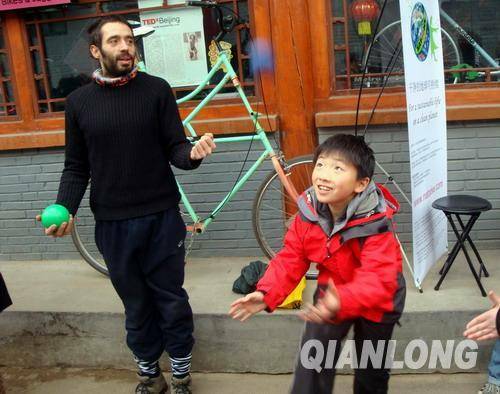 I found an entry about our Natooke Juggling and bicycle shop on on the travel website of sina.com. 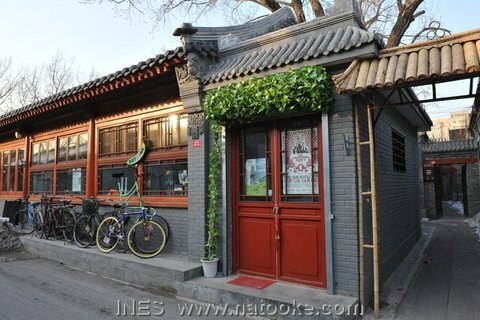 What a surprise to be mentioned here as a special store on the cool Wudaoying hutong street in the center of Beijing. 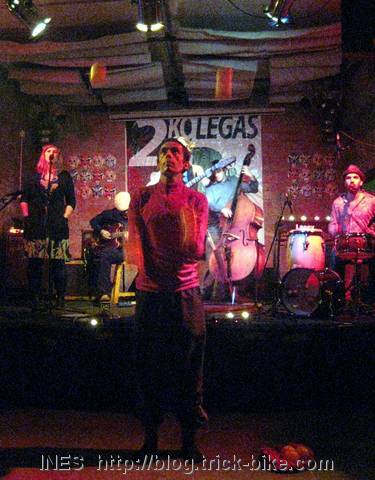 Today was the last day before Fede will go to Africa. And I am going to go to Europe in 3 days. 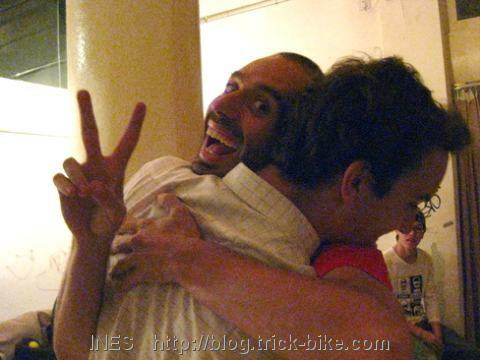 So this was the last Beijing Jugglers Group meet-up until September 23rd. 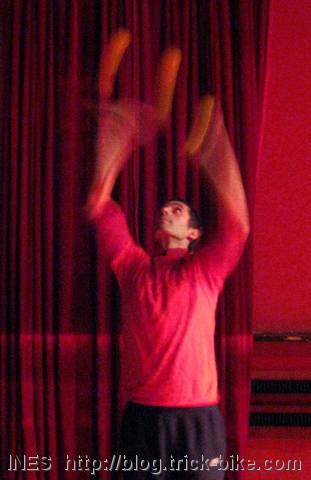 But also for some other jugglers it was the last time with us in Beijing. 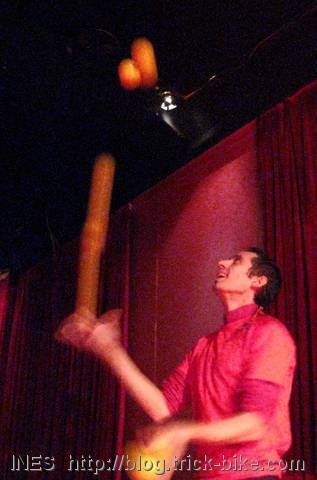 Like our multi-talented Joe that had just spent 4 hard weeks at the Chinese National Circus School in the South of Beijing to increase his acrobatics, staff juggling and 5 ball juggling skills. He was in Beijing for almost 1 year and now had to go back to the USA to continue his studies. 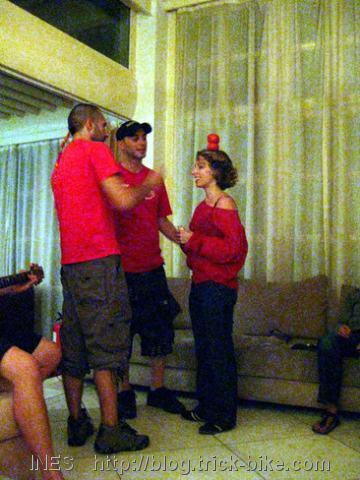 It was a sad juggling evening. 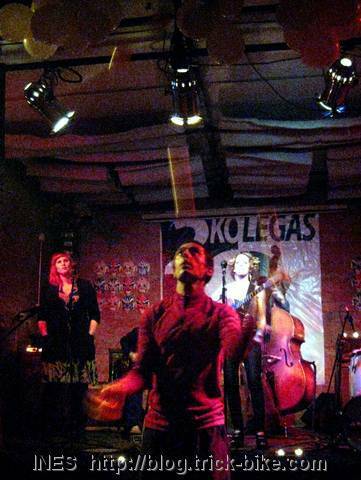 But in 3 weeks we will start again. 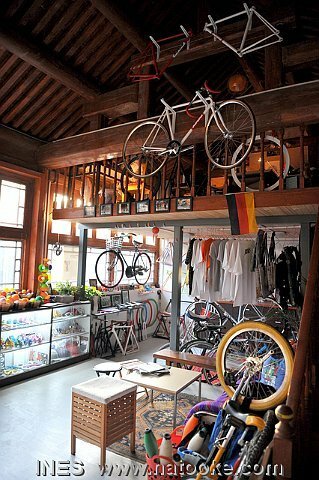 This store is dedicated to urban cycling. 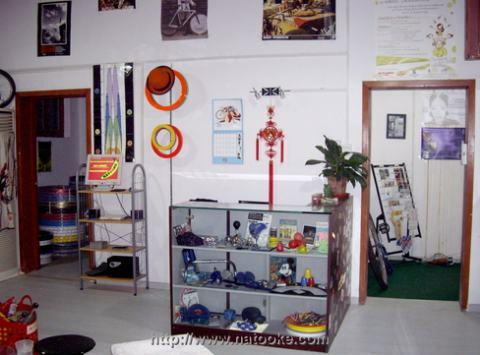 You will not find a bike with gears in this shop, so no road bikes nor any mountain bikes. 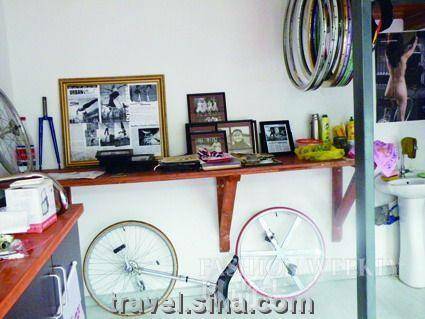 All bicycles are single speed and mainly have a fixed back wheel, meaning no ability to coast. Like the bikes used in the velodrome these are track bikes with horizontal dropouts in the back end of the frame to be able to adjust the chain tension. 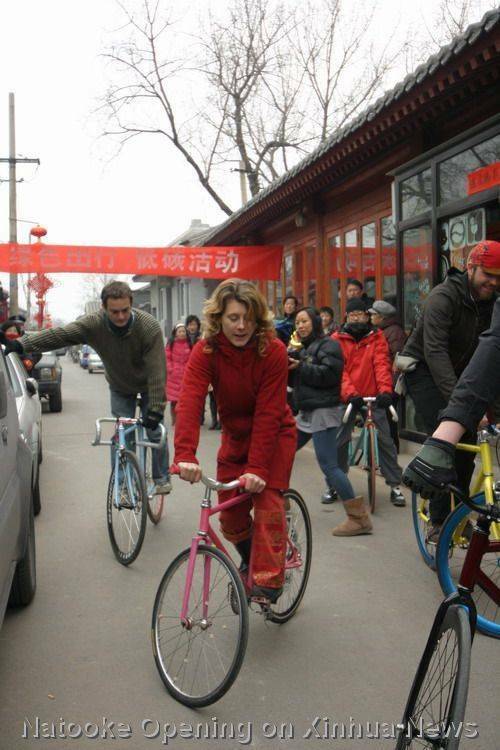 This is extremely suitable for cycling in the flat and nicely paved Beijing urban city. The shop has all the different parts required to build up a fixed gear bike like the fixed gear hubs, flipflop hubs, cogs, lock rings, rims, tires, seat posts, saddles, stems, handle bars, handle bar grips, chains, cranks, chain rings, pedals, cages, toe clips, straps… Each customer can chose what brand, what style and which color he prefers so that we can put together that one-of-a-kind unique bike. 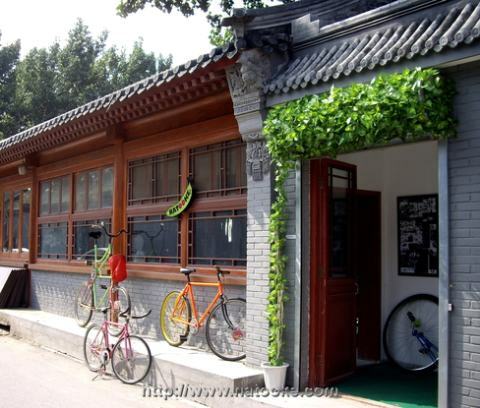 This shop also has a huge selection on urban cycling accessories, like T-shirts, lights, bags, reflective bag covers, anti-pollution masks and other things related to cycling in the metropolitan areas. 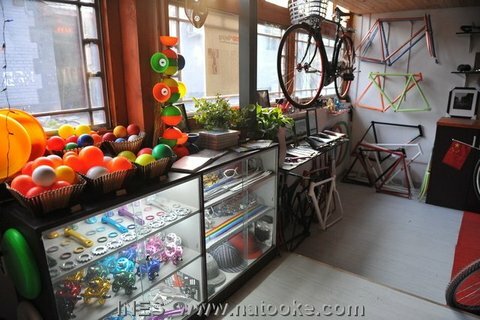 The NATOOKE store is even more unique: It is the world’s first shop dedicated to fixed gear bikes and juggling equipment! 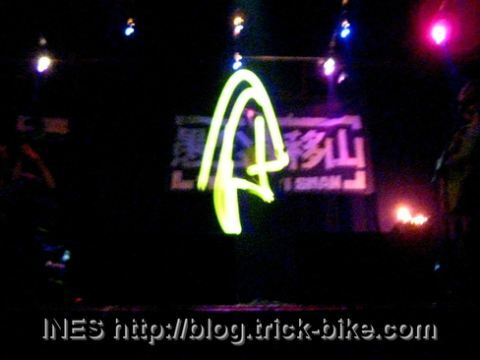 You can find anything here around the topic of juggling: Different sizes, weights and colors of juggling balls, glow balls, contact balls, acrylics, juggling rings, juggling clubs, devil sticks, diabolos, poi, fire juggling equipment, staff, yo-yos, frisbees, rola bolas (also known as balancing boards) and many more fun toys to play with. 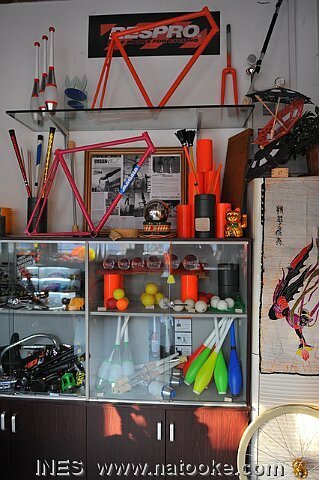 This is the best juggling equipment that you can get in all of China. It is mainly imported from Europe. My friend Xiao Lu dropped by the shop today. He had the typical fixed gear injury a few weeks ago: Two of his fingers got squished between the chain and the cog while he was helping a friend fix his flat rear tire. But he was lucky none got really chopped off. 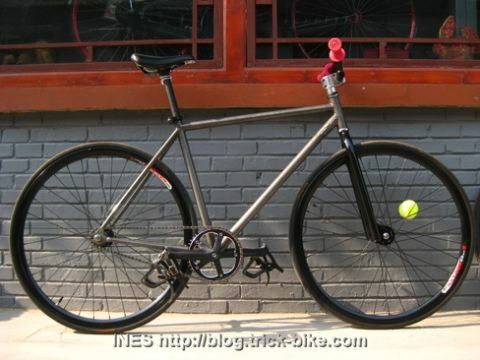 He showed me his new fixed gear bike. Unfortunately he cannot really ride it as his fingers need to heal first. 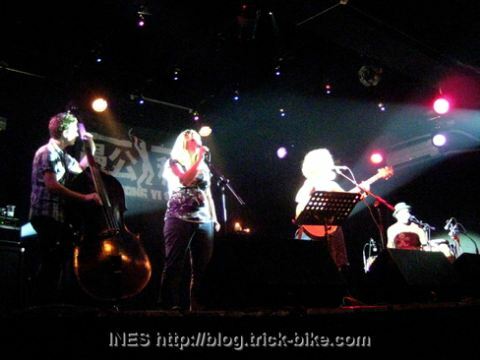 In the evening Jess and her 3 band members had again a concert in Yugong Yishan. 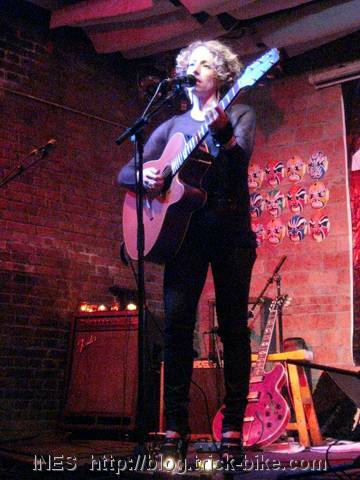 Jess was playing some of her new songs that her and the band are currently recording for her new upcoming songwriter CD. 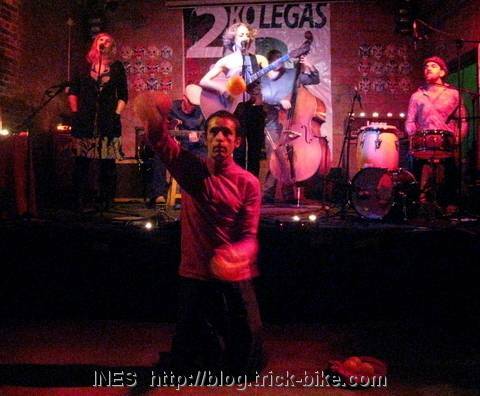 Fede did some glowball juggling during one of the songs. 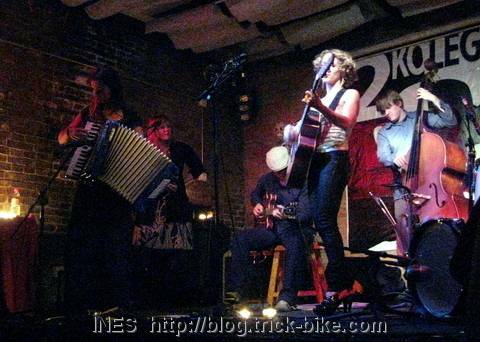 My small camera is not good enough to take pictures in such low light environments. 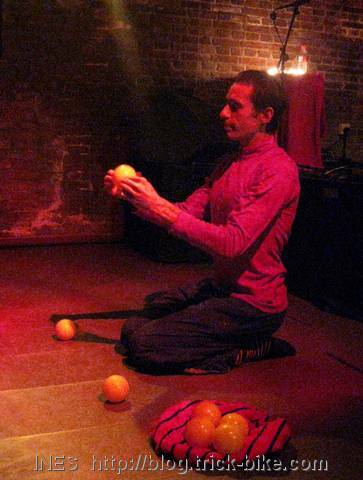 The juggling workshop in the big space called „The Orange“ in the Village is great. 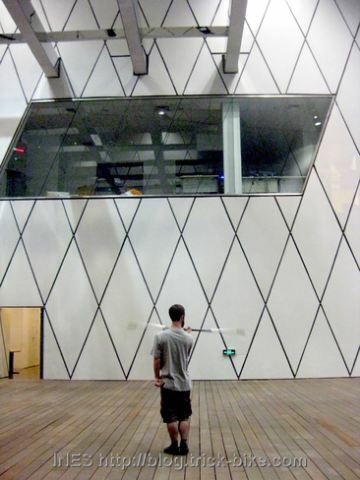 The ceiling is so high and whatever you are practicing – like my friend Jib spinning staff – you always have enough space. 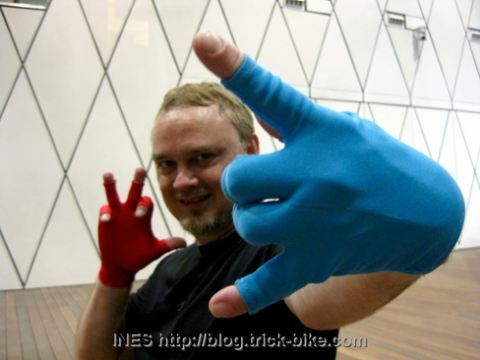 Today the finger fitness pro Greg Irwin showed up. 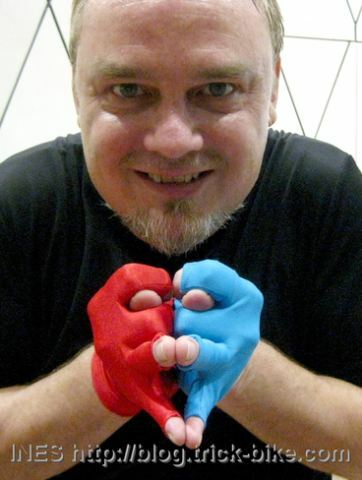 He does special finger isolation training for musicians and magicians. 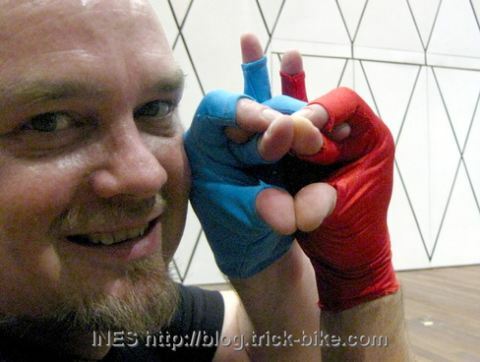 It is amazing how he can coordinate each finger muscle. There are some great videos online. 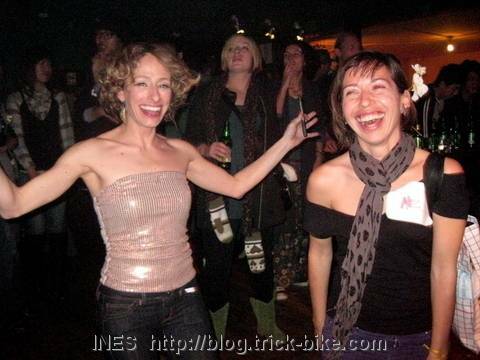 You are currently browsing the archives for the Juggling category.